Pouring from a pitcher with something like corn is perfect play practice for the real world task of pouring drinks from a water pitcher. Preschoolers often do this in a preschool setting at snack time, and pouring drinks for their friends is fun! I've seen Big Sister glow with excitement when I have her pour water for us at lunch time here. You can see her self-confidence growing! 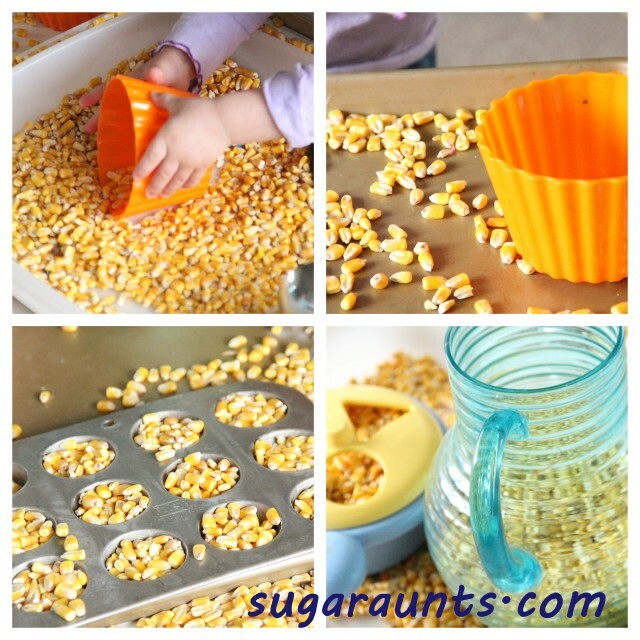 Baby Girl watched Big Sister fill the pitcher with corn and pour corn into the muffin tins. (We were making "cupcakes" for Daddy!) Baby Girl then had to copy and pour the corn. Of course. This girl does EVERYTHING the big kids do! If you are worried about the mess, lay down a blanket first and do all of the pouring and scooping on the middle of the blanket. You could also play in a baby pool. Or, just head outside now that we are having some warmer weather.